Were should my backyard orchard be planted? Fruit Trees prefer a well drained soil, But if we have soil that is more clay or all sand we can add soil amendments and build a soil bed that will encourage fruit production. What Fruit do I want? We all may have a wish list but we may have to take a step back and ask what are the best fruits to grow in our area ?, varieties of fruit will depend on which part of the country you live in. What Purpose do I want Fruit Trees for? What Size do I want my tree to grow? patio, dwarf, semi-dwarf, standard, and more recently Coulmnar or "colonnade". Each type grows to a certain size range and stops growing after that. selecting varieties for our own particular area based on hardiness is best for home gardeners. We all want to be successful in our Back Yard Orchard and most of us don’t want to spend hours and hours like the producers do caring for our trees. Note for warmer climents there are Chilling Hours related with varieties that many help with selection. Most pollination can be done with out spending extra amounts on unwanted trees. Knowing the varieties and their pollinators is the best way to insure good pollination and more than likely we are adding a few different varieties of the same fruit and they will be able to do the job. Most varieties require a pollinator and Bees being the best pollinator will travel miles to other orchards so pollination usually isn’t an issue. If planting a Container tree dig your hole twice the size of the container they come in and just as deep knowing that the graft (the knob on the lower trunk of the tree) needs to be above ground to insure good growth. Use a good planting mix that you mix with half of the soil you removed from the hole. Never place leaves or manure in the hole while planting or fertilizer, some Garden center trees will have some sort of slow release fertilizer added to their soil and there is no need to add fertilizer while planting that can be done on top of the soil later. After planting your tree, be sure to water the tree deeply. This will insure that the tree is going to bed for the season wet not dry. In cold climates Trees need to Freeze wet not dry to prevent Winter Kill. In warm weather climates the trees may not be growing and producing in the fall but they are alive and need moisture in these dry times. Fertilizer isn’t as important now in the fall as it will be in the spring. remember always to keep the roots of the bare root trees moist while you prepare to plant. If needed heal your trees into some moist soil while your holes are being dug or get your holes dug ahead of time of receiving your trees. Be sure to soak your bare root tree in a bucket of fresh water for at least 10 to 12 hours this will allow the roots to take on needed moisture for planting. All along the roots and trunk of the trees there are doormat root cells and these take in water. Dig your holes for your bare root trees according to the size of the root mass, at least 3 feet wide and 2 feet deep. Plant your tree using the soil that came out of the hole mixed with a good planting mix , if you choose to add other amendments studies have shown that the best amendments are low bulk sources of minerals, such as bone meal, soft rock phosphate and kelp meal and should be mixed with some topsoil and added to the bottom of the hole ,under the tree. Training young fruit trees is essential for proper tree development. It is better to direct tree growth with training than to correct it with pruning. Pruning is most often done during the winter, commonly referred to as dormant pruning. Training includes summer training and summer pruning as well as dormant pruning. The goal of tree training is to direct tree growth and minimize cutting. Trees respond very differently to dormant and summer pruning. Dormant pruning is an invigorating process. During the fall, energy is stored primarily in the trunk and root system to support the top portion of the tree. If a large portion of the tree is removed during the winter, while the tree is dormant, the tree's energy reserve is unchanged. In the spring, the tree responds by producing many new vigorous, upright shoots, called water sprouts, which shade the tree and inhibit proper development. Heavy dormant pruning also promotes excessive vegetative vigor, which uses much of the tree's energy, leaving little for fruit growth and development. Historically, much of the vigorous, upright vegetative growth has been removed during the dormant season; heavy dormant pruning results in a yearly cycle with excessive vegetative growth and little or no fruit production. Timing of dormant pruning is critical. Pruning should begin as late in the winter as possible to avoid winter injury. Apple and pecan trees should be pruned first, followed by cherry, peach, and plum trees. A good rule to follow is to prune the latest blooming trees first and the earliest blooming last. Another factor to consider is tree age. Within a particular fruit type, the oldest trees should be pruned first. Younger trees are more prone to winter injury from early pruning. Summer pruning eliminates an energy or food producing portion of the tree and results in reduced tree growth. Pruning can begin as soon as the buds start to grow, but it is generally started after vegetative growth is several inches long. For most purposes, summer pruning should be limited to removing the upright and vigorous current season's growth; only thinning cuts should be used. To minimize the potential for winter injury, summer pruning should not be done after the end of July. When making pruning cuts, it is important to use techniques that will allow the cut surface to heal quickly. Rapid healing minimizes the incidence of disease and insect infection. Pruning cuts should be flush with the adjacent branch without leaving stubs. Also, when large horizontal cuts are made, they should be slightly angled so that water does not set on the cut surface, allowing the growth of rot and disease organisms. Many compounds are available as wound dressing or pruning paints. But the best treatment is to make proper pruning cuts and allow the tree to heal naturally. If preferred, tree paints and wound dressing may be used for aesthetic reasons, but they will not promote healing. 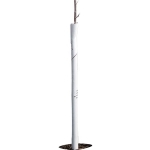 Bark Protection: Protect trees from rabbits, mice, voles, other rodents, mechanical damage and sun scald tree guards inexpensive and easy to put on. These protectors are sold at most farm stores we did get this link from Peaceful Valley in Grass Valley California. What Varieties are good for my area? I called and spoke to my local orchards and they were able to give me some great advice for my back yard orchard keeping in mind that you should explain that you are not wanting to jump into the orchard business but would like them to recommend a few varieties that are a sure thing and take less work. Anna is the executive Director for the Wisconsin Apple Growers Association and she was very helpful with these varieties for zone 4-5. I spoke with David Lillard of Mercier Orchards of Blue Ridge Georgia and was also very helpful for Zone 7, recommendations. Twig Varieties which are an heirloom apple Red Twig Black Twig most common of the native apples. Not a lot to look at but very disease resistant hardy as well as productive. Roam Beauty not a good looking apple but consistent and great flavor. Late Season: Granny Smith 100% the best apple for the area. I recieved some very helpful information from Sarah at Stark Bro's Nurseries from Louisiana, MO . I asked Sarah to help us with some Plum varieties for the home orchard. 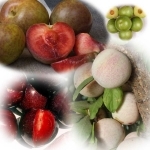 Most plums you find in grocery stores (the round reddish-purple colored ones) are Japanese plums. The trees are ideal for people who live in zones 5-8 (although you may find certain cold-hardy or heat-tolerant varieties as well). One of the best plum trees I can think of is the Methley Plum. It's a seasonal looker (especially its showy blossoms in the spring), a self-pollinating tree, and disease resistant, which means less need for sprays. Ideal for backyard growers! Dwarf plum trees get to be 8-10 feet tall. Methley is a heat-tolerant variety plum, so even people in zone 9 can grow this tree successfully. 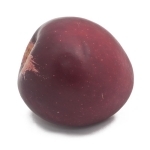 I would also recommend the Santa Rosa plum, for very similar characteristics to the Methley plum, but the fruit is slightly larger and the tree is a more vigorous producer of the fruit. Sweet cherries thrive in very similar zones as plums. Most are ideal for the 5-8 zone range with a few exceptions, depending on the variety. There is a sweet cherry variety called Blackgold that is frost tolerant (it blooms late to avoid late spring frosts that can zap blossoms and ruin chances at fruit production that year), disease-resistant, crack resistant (cherries can be prone to cracking especially when the weather has been dry and then it rains while the fruit is maturing. Cracking is *mostly* an aesthetic thing, since the fruit is still edible if it does.) and it is self-pollinating as well. Similarly, there is a sweet cherry variety called Whitegold (easy to remember these two together!) that has a yellow-red fruit, as opposed to the dark fruit of the Blackgold, and it has all of the resistant qualities of the Blackgold cherry tree. I received some great information from one of the leading Fruit Tree Suppliers Peaceful Valley who is based in Grass Valley California; Charlotte from Peaceful Valley informed me that Peaceful Valley sells over 10,000 bare root fruit trees starting in December. Charlotte shared some amazingly delicious and unusual fruit varieties with me for the home orchard . Late: Dapple Dandy, zones 5-9. My favorite apple for our region is an apple that was found in the Sierra Nevadas in the 1890's. Looks: Yellow-Green with aggressive pink strips. It's a good sized apple that has a kind of flattened shape. Personality: Rich, sprightly flavor, moderately sweet with a tangy finish. Juicy, crisp and firm fleshed. Excellent fresh or cooked. Facts of note: Favorite in colder regions. Wonderful processing apple because of its rich flavor and the ability to hold its shape when cooked. Favorite late apple in northern California, it was discovered in the Sierra Nevada mountains in the 1890's as a chance seedling. It was thought to have been left behind by a mining camp. It's noted for keeping five months or more without refrigeration. It's a heavy bearer with a tendency to be alternate bearing. This variety came and went a couple of times. It emerged in Chico in the 1920's and then disappeared. It was found again in the 1980's in an old orchard owned by the Gowan family in Anderson, CA. The tree has a nice upright growing habit. Part of Slow Food's "Ark of Taste" One of the other really cool things about Sierra Beauty is that it is self-pollinated, not particularly common among apple varieties. Another neat one that is grown by a local apple orchard. Looks: Large, apples with unique dark red skin. Personality: Very crisp flesh, the sharp flavor improves with age. Facts of note: Favorite in colder regions. Arkansas Black Spur is a wonderful late season apple that will keep many months and becoming darker the longer it's stored. These apples are an excellent variety for cider or for fresh eating through the winter. The fruit retains high quality even with warm nights. This variety was developed in Arkansas in the mid 1800s. The skin has a really interesting texture, almost a waxiness to it. Pollination: Partially self-fruitful, does much better with pollenizer. Golden Delicious and Granny Smith work well. Historically grown in our area and throughout Northern California (since 1811) is the Gravenstein. It was originally brought to the area by Russian trappers. Looks: Green with red stripes. Personality: Produces juicy, flavorful and tart apples. Famous for sauce, baking and fresh eating. Facts of note: Early bloom and early harvest. A favorite in colder climates. Very cold tolerant and one of the first cold hardy apples to harvest. Gravenstein is an ancient variety from Denmark, mentioned first in 1797 but the variety predates that mention. The mother tree is thought to be in Graasten Castle in Jutland, Denmark. The national apple of Denmark. Part of Slow Food's "Ark of Taste"
This next one is a very old apple variety from England. I know folks who grow this and rave about it. It's not an apple for the beginning grower, it can be touchy. But everyone who I know who grows it thinks it's worth it and more. Looks: Green underneath golden brown russet skin, with red highlights. Creamy yellow flesh. Oddly shaped and somewhat small. Personality: Aromatic, crisp and sweet. Use for dessert, cider and sauce. Facts of note: Considered by many as the best tasting and most unique tasting apple, this is probably due to the fact it has no known relatives among other apple varieties. This is one of the few old world apples to be cultivated in America. The cultivar came from a tree planted by Dr. Ashmead in Gloucester, England in the 1700s. Great for eating fresh, cider making and baking. Stores up to 4 months in the refrigerator. Regular pruning and and thinning is a must. It is not a precocious bearer like most modern varieties. The tree can take as long as 3-4 years to start bearing, and then bear lightly and flower erratically in the beginning. Pollination:Partially self-pollinated, does much better with pollenizer. Golden Delicious is a good one.